I love Google. I use Gmail, Google Maps, Google Docs, Google Calendar, Blogger, all sorts of Google applications. But then, every once in a while I find a reason to hate Google. Google has a company policy to never be evil, so hopefully they don’t turn into a 21st century Microsoft. I can appreciate that. 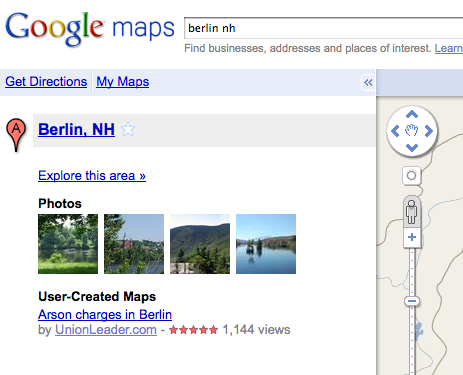 But then how come when I type Berlin NH into Google Maps, the tag that comes up under Explore this area is a couple photos and Arson charges in Berlin? This is the type of thing that makes me consider Google evil. Come on Google! I’m saying the city needs a marketing campaign, but it’s damn hard to argue with Google, a search engine so ubiquitous its become a verb. This is not the type of coverage the city needs. I know, it isn’t really Google’s fault, because the map was made by the Union Leader. But wouldn’t it be so much nicer to have a map made by the recreation department, or the city marketer, showing the city’s parks and recreation spots? How about its swimming holes? Or its historic buildings? Its churches? They wouldn’t erase the word arson from showing up on the side of the Google search, but they would at least put the word in context. Berlin isn’t all burned out buildings, but look to Google and that’s what it appears. Who wants to do something about that? Thus far, the answer is no one. That makes it hard to point the blame at Google. Berlin is/was known for being stinky. Now it's getting known for fires. Can't get a break. We need to have something else to talk about other than the negative stuff. Even the positive things have been difficult to be proud about/brag about, like the prisons. We need to rally around a goal or project and the conversation will change.